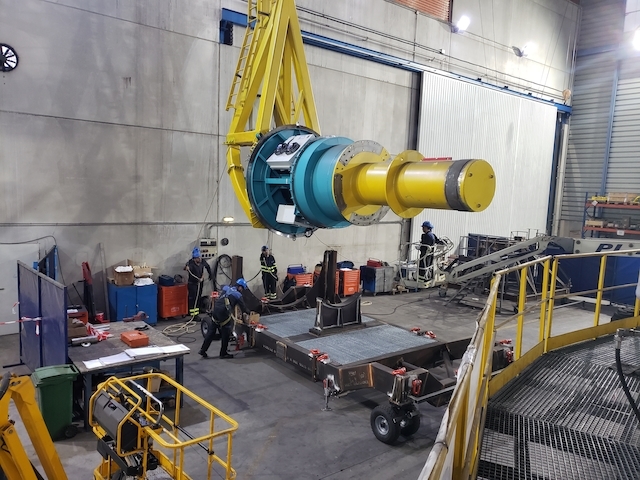 One of the activities included in Factory Acceptance Testing of the Telescope Mount Assembly (TMA) is installation and removal of the camera surrogate, a steel structure that approximates the mass of the LSST camera assembly, using the camera lifting fixture. The camera lifting fixture, like the TMA, was fabricated at the Asturfeito factory in Spain. Using a camera surrogate for these tests ensures that any issues arising during the installation or removal process can be addressed long before the real—and far more delicate—camera is integrated with the TMA in Chile. This video contains footage of the installation and removal of the surrogate camera using the camera lifting fixture.